“Police mistakenly shoot 911 caller during manhunt,” read a recent headline in USA Today. 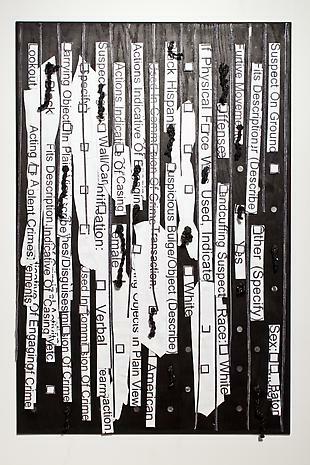 Nari Ward, Suspicious Buldge, 2012. Tension was thick in Ferguson, Missouri, while the citizens awaited the grand jury decision on the case of Michael Brown, the unarmed teenage boy shot in the back by a police officer. Emotions were unleashed with the announcement of the jury’s decision not to indict Officer Warren as the answer to justice. 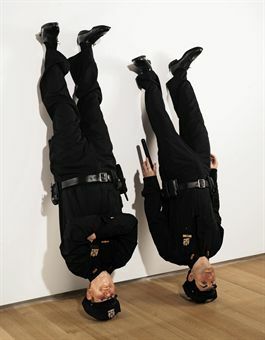 Muarizio Cattelan, Frank and Jamie, 2002. I’ll share my own inane encounter with a peace officer. I often cycle on a quiet, one-lane residential street that is mostly a well-ridden bike lane. There are stop signs at intersections to keep motorists from using this neighborhood side street to bypass traffic on the busier, adjacent two-lane road. Routinely, cyclists do not stop at the stop signs—some may slow down rather than speeding through them, as I did recently. Regrettably. Passing through this lane, I was overtaken—more precisely, cut off—by a police car with flashing lights. I thought to myself, “Whoa, this is aggressive enforcement for a cyclist stop-sign violation.” I abruptly braked, clipped out of my pedals, anticipating my lecture on bike safety. Instead, the police officer stepped out of his vehicle, shut his car door without even glancing in my direction, and went off at a waddling pace holding a gun in his hand. I don’t mean touching his holster, where his gun should have been. I mean he was wielding a gun in the air as he ambled toward the white picket fence in front of his parked vehicle. There he stopped and looked intently, rather nervously, at the house. I realized then that my stop-sign infraction was not his objective. And as comical as the scene might be to recall—chubby cop, waddling like a toddler, toting his weapon—it really did concern me. The police officer could have caused me to crash by cutting me off. If he believed there was imminent danger, could I have been in the line of danger, and should he have warned me to stay back from a potentially dangerous situation? I feared for any cat that might cross that yard—the officer appeared ready to shoot at anything. As I cycled away, I could feel the entire scene had frightened me. I considered returning to see what was the emergency situation, or to get the officer’s information and report the encounter, but then the thought of reporting a police officer frightened me even more, the prospect that I could be targeted as a troublemaker. Feeling bothered, I quickly pedaled home. I am not writing this to ignite a fury against police officers. It is one encounter with one officer. In the larger scheme, I deeply respect the risks that police are willing to face in the line of duty to maintain order in our communities. I surmise they hold one of society’s most stressful jobs. No, I would not prefer to live in a lawless society. I have never been faced with a dangerous, life-threatening experience, and if it were to happen to me, I would like to know the police were there to protect me. My son’s friend, John, told me a story passed along from his father. When John was a baby, he had difficulty sleeping through the night, crying his lungs out. On one particularly mild evening, his father decided to take him out for a stroll rather than pace the apartment. Not more than three blocks from home, a police car stalked them down. Interrogating John’s father with a harassing tone, the police questioned him whether this was indeed his son and what business he had wandering the neighborhood at night. It is not that I long for the days of Mayberry R.F.D., a fictional time when life was simple and the sheriff never carried a gun. But I would like to see and read more heartwarming stories where the officer of the peace maintains a calm, friendly vibe. 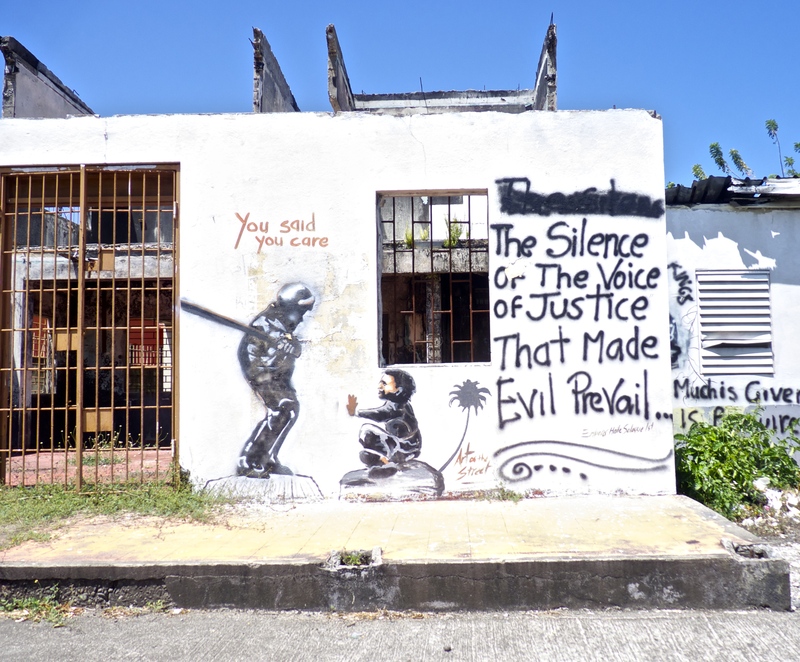 Not too long ago, I was traveling in Jamaica with my son. We hired a driver to take us to the rural, “road-less-traveled” side of the island to visit seaside villages and local farmers markets. Our driver wanted to take us to his favorite restaurant in Port Antonio. Unfortunately, all the vegetables were in the markets and there was nothing on the menu for me, a vegetarian, to eat. 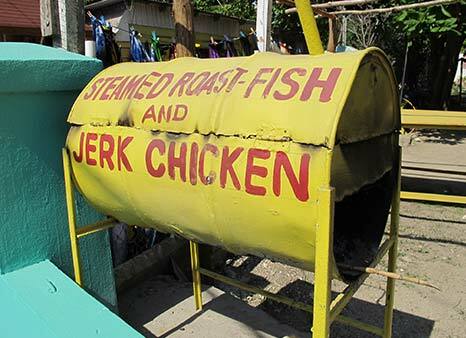 We decided to drive further along the highway to Boston Bay, known for the best jerk chicken on the island. Our driver, worrying we wouldn’t find any fresh plantains, yams, or ackee, waved down a police car to ask the officers if they knew of any restaurant where we might find both jerk chicken and vegetarian cuisine. The officers chatted amongst themselves, made a call, and sent us on our way. Apparently, they’d phoned their favorite jerk chicken spot to inquire if the cook could prepare a meal for me. When we arrived the restaurant knew who we were (the only tourists) and we didn’t even need menus. They prepared our lunch, and it was delicious! Later, the two officers stopped by to see how we liked our lunch. Bursting with flavor, police officers assist tourists in a unique, delectable local lunch. Wouldn’t it be nice to read more headlines like this? True, they provided an unforgettable experience and a happy tummy. More importantly, I’ll remember their “Yah mon” calm.